Click Upgrade next to the support icon (?) in the navigation bar of your account dashboard. Or, click your name in the top right corner, then select Upgrade. 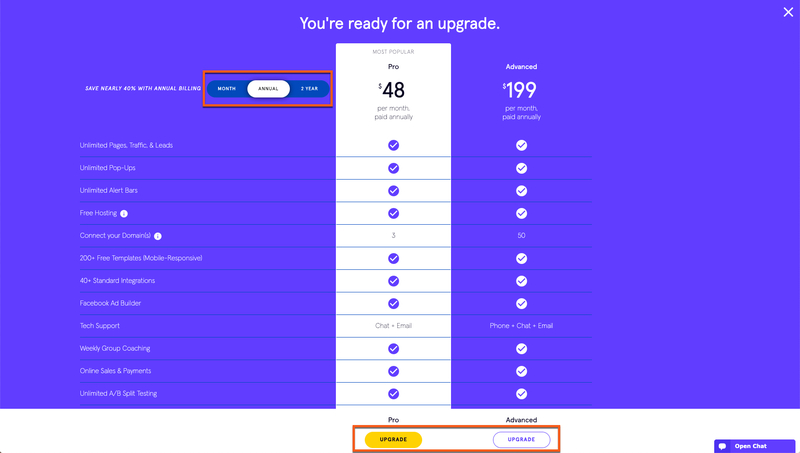 Review the available plans, then select Upgrade for the plan you’d like to switch to (as shown below). TIP: You can save money by paying annually or every two years for your Leadpages subscription. Fill out any payment details as necessary, then you’ll be all set! Enjoy your new subscription. In most cases, you’ll be charged immediately upon upgrading your plan. Kindly note, if you change your plan during a trial, you will not be billed until the end of your free trial. All of our plans renew automatically (on a monthly, annual, or two-year basis). A new billing cycle begins any time you change your subscription. When you change plans, you’ll lose access to any locked in pricing or features from your old plan. If you decide to switch back to your original subscription in the future, you’ll be subject to any changes in pricing or features. Looking to change to a lower plan? If you need to switch to a less expensive plan for whatever reason, just let us know and we can help you out. Since changing your subscription can prevent you from accessing certain features or locked-in pricing, we do require you to confirm those changes.